"[L]iberty must at all hazards be supported. We have a right to it, derived from our Maker. at the expense of their ease, their estates, their pleasure, and their blood." The Battle of Kings Mountain was a decisive battle of the American Revoluton. It took place on October 7, 1780, nine miles south of the present-day town of Kings Mountain, North Carolina. The Patriot militia defeated the Loyalist militia commanded by British Major Patrick Ferguson. Washington County, Virginia was formed from Fincastle County in 1777. It originally contained Sullivan County, Tennessee. William Humphreys was born about 1745 in Ireland. His parents were John and Susannah Humphreys. According to his pension application, William lived in the part of Virginia that became Washington County, Tennessee. He enlisted in 1778 0r 1779 and served for about 8 months until fall, 1780. He was a private in the Virginia militia under Captains James Montgomery and Edmondson, Colonels Shelby and William Campbell. During his service he fought the indigenous people. His unit guarded a mountain pass at the time of the Battle of Kings Mountain. After the Revolutionary War, he resided for five or six years in Washington County, Virginia and then moved to the section which became Washington County, Tennessee where he remained until 1819 when he moved to Blount and Monroe Counties. He had no settled home, but lived with his children in both counties. William Humphreys appeared on the 1814 tax list of Washington County, Tennessee. 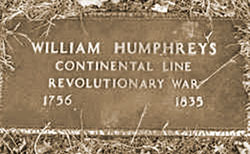 James Humphreys was in Captain William McLin’s Company during the War of 1812 from October 12, 1813 to February 8, 1814. In 1834 the Revolutionary War pension application for William Humphreys was declared invalid in Monroe County, Tennessee. The American folk hero, David "Davy" Crockett (1786 – 1836), grew up in East Tennessee. Tennessee was admitted to the Union on June 1, 1796. It was initially part of North Carolina. East Tennessee is part of Appalachia. At the end of the French and Indian War, colonists began drifting into the area. In 1769, they first settled along the Watauga River. During the Revolution, the Overmountain Men defeated British loyalists at the Battle of Kings Mountain. The State of Franklin was formed in the 1780s, but never admitted to the Union. The Cherokeewere indigenous people who lived in the southern Appalachian mountains. European Americans called their towns in eastern Tennessee, the Overhill Towns. The towns included Chota, Tellico and Tanasi. In 1776, the Cherokee planned to drive settlers out of the Washington District. The settlers were warned and stopped the first attack at Heaton's Station. The second attack was stopped at Fort Watauga. In response to these attacks, the militia burned Tuskegee and Citico. In 1780, while the militia was away at the Battle of Kings Mountain, the Cherokee raided the setttlements. When the militia returned, Colonel John Sevier's men defeated the Cherokee at Boyd's Creek and destroyed most of the remaining towns. On this 17th day of September personally appeared in open Court before the Justices of the County Court for said County now sitting William Humphreys a resident of said County of Monroe, aged about seventy-nine years, who being first duly sworn according to law doth on his oath make the following Declaration in order to obtain the benefit of the Act of Congress, passed June 7th 1832. That he was born in Ireland, the year he cannot exactly state, having no record of his age. He was living in what is now Washington County Virginia when called into service; where he lived five or six years after the revolution, then moved into Washington County (as it is now) Tennessee, where he lived till about fifteen years ago, since when he has lived in Blount County and the said Monroe, which are adjoining, with his children who live in the said Counties, having no settled home, other than said residence among his children being sometimes in one County and sometimes in the other. He was drafted each term of service as a private of militia. In, so well as he can tell, the year 1778, he was drafted for a term of three months in the company of Captain James Montgomery under Colonel Arthur Campbell and marched on down through the Country (crossing French Broad River) down to the Tennessee River, and to the boundary of what is now said County of Monroe. This expedition was against the Cherokee Indians. Nothing occurred of importance this campaign, except that Captain Elliot was killed in going from Chota Town to Tellico Town. He was in service this campaign so well as he remembers two months. He was discharged; but whether in writing or not he disremembers. He went on horseback this tour. The same year or in 1779 he was drafted again for three months under the same Colonel and in the same company, but under a new Captain whose name he forgets. They marched up to the head of New River against Tories and Indians who were said to be lurking there. They found no embodied troops, and nothing of importance. He was discharged by the Colonel before the term expired having served, he is convinced, at least one and a half months. He was in Infantry. After being at home a few months, he cannot say exactly how many, he was drafted again for a term of three months, in the same company under Captain Edmiston, under Colonel Shelby. This tour they marched on down to Chickamauga, on the Tennessee River, against the Indians. This was a campaign of great severity as they went down in canoes and suffered greatly for something to eat – having nothing but a trifle of meal for 15 days. They did nothing this campaign but killed a few Indians, scattered them, burned their houses, corn &c. There was a [word written over and illegible] made of some property taken from the Indians & Applicant bought a pony which he rode home. He served this campaign at least 2 1⁄2 months. If he received any written discharge in the last two campaigns he forgets it. All he thought of was getting released, and how the Colonel did it he forgets. In the fall of 1780, he was drafted for three months under Captain James Montgomery, under Colonel William Campbell to go to the South against the British and Tories. After marching on a quarter part of the way to Kings Mountain Applicant with perhaps nine others was ordered to go and watch a gap in the Mountain to prevent Tories and English from coming in upon the settlement while the men were all gone. There they stayed till the troops went on and were at the battle of Kings Mountain; and saw Colonel Campbell no more that campaign. The company was soon discharged, after the battle; but applicant did not get a written discharge as he knows he had no chance. He was in service this campaign, so well as and impaired memory enables him to state, not less than two months. In all eight months – and each time in militia – a private of Infantry except that the first campaign he went on horseback, and lost a fine horse from eating cane after being full of corn. He has no documentary evidence and knows of no one who can testify to his service. He hereby relinquishes every claim whatever to a pension or annuity except the present and declares that his name is not on the pension roll of the Agency of any State. The following persons his neighbors can testify to his character for veracity and their belief in his services as a Revolutionary Soldier, viz. He went each time of service from the same neighborhood – Washington County Virginia. The New River flows through North Carolina, Virginia, and West Virginia .In 1755, Mary Draper Ingles (1732-1815) was captured by Shawnee warriors near Blacksburg and taken to Ohio. She escaped and made her way home by following the Ohio, Kanawha, and New Rivers.